BOSTON, MASS. and WASHINGTON, D.C. - In yet another record-breaking year, the solar industry in the United States installed 7,286 megawatts (MW) of solar photovoltaics (PV) in 2015. GTM Research and the Solar Energy Industries Association (SEIA) announced the historic figures today ahead of the March 9 release of the U.S. Solar Market Insight report. For the first time ever, solar beat out natural gas capacity additions, with solar supplying 29.5 percent of all new electric generating capacity in the U.S. in 2015. Led by California, North Carolina, Nevada, Massachusetts and New York, the U.S. solar market experienced a year-over-year growth rate of 17 percent. Geographically, the market continues to diversify with 13 states installing more than 100 MW each in 2015. 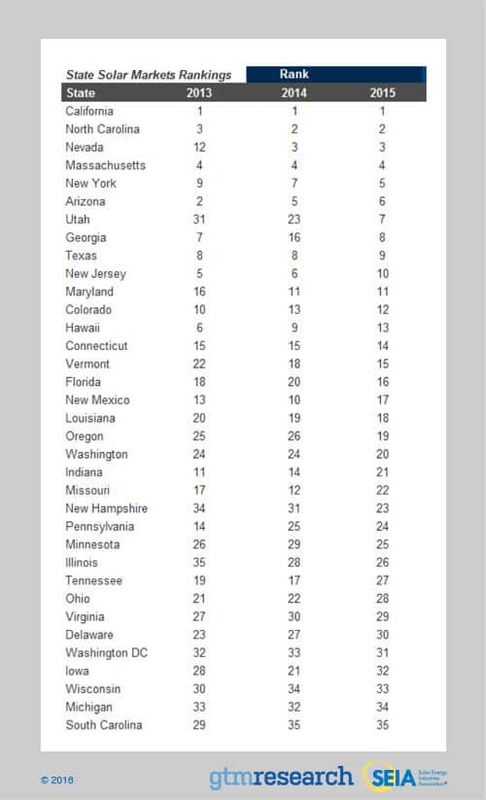 States that made major solar strides include Utah, which jumped in ranking from 23rd to 7th place, and Georgia which moved from 16th to 8th in the nation. 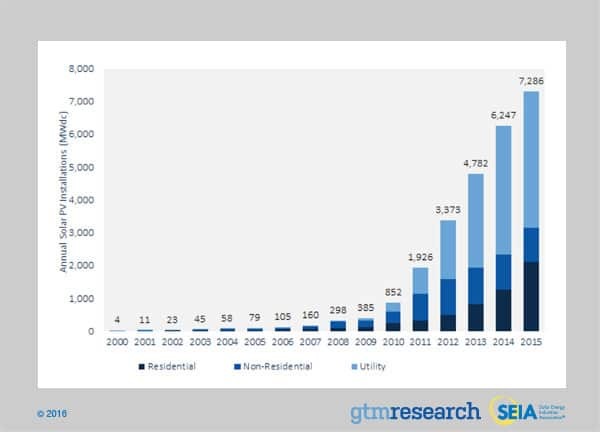 The residential solar market grew 66 percent year-over-year and, for the first time in history, eclipsed two gigawatts (GW). 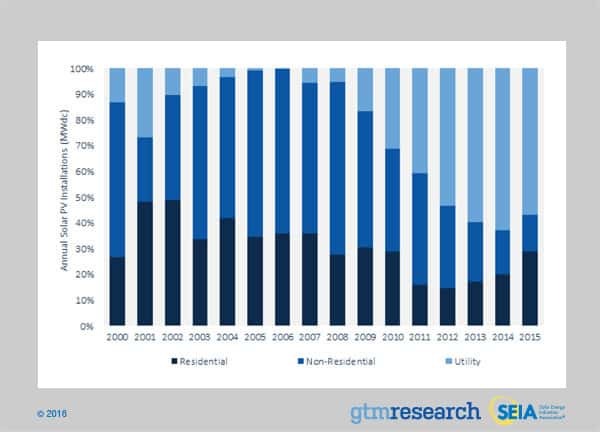 The residential solar segment now represents 29 percent of the entire U.S. solar market – its largest share since 2009. For the fourth year in a row, the non-residential market broke the 1 GW mark, but remained roughly flat year-over-year. The utility-scale sector, the mainstay of the U.S. solar market, grew six percent year-over-year and represented more than half of all solar PV installed in 2015. Cumulative U.S. solar PV installations have now topped 25 GW, up from just 2 GW in 2010. On March 9, GTM Research and SEIA will release the complete U.S. Solar Market Insight 2015 Year-in-Review with detailed market analysis and updated forecasts. For more information, visit http://www.seia.org/smi. The U.S. Solar Market Insight report is the most detailed and timely research available on the continuing growth and opportunity in the U.S. The report includes deep analysis of solar markets, technologies and pricing, identifying the key metrics that will help solar decision-makers navigate the market's current and forecasted trajectory. For more information, visit www.seia.org/smi. GTM Research, a division of Greentech Media, provides critical and timely market analysis in the form of research reports, data services, advisory services and strategic consulting. GTM Research's analysis also underpins Greentech Media's webinars and live events. Our coverage spans the green energy industry including solar power, grid modernization, energy storage, energy efficiency and wind power sectors.